JACKSONVILLE, FL (09/13/2014) The University of San Diego Toreros (1-1, 0-1 PFL) opened Pioneer Football League play with a 35-18 road loss to the Jacksonville Dolphins (1-1, 1-0 PFL) Saturday afternoon. The Toreros turned the ball over four times and allowed Jacksonville's offense to put up 447 total yards. The Dolphins struck first after a fumble on a punt return led to a 16-yard touchdown pass from Kade Bell to Andrew Robustelli. A five-yard touchdown run by Ulysses Bryant gave JU a 14-0 lead early in the second quarter. USD finally got on the board after a forced fumble by Troy McClelland set up Keith William's nine-yard touchdown pass to Brandon White. After recovering another fumble on the ensuing drive, a 33-yard field goal by David Last cut the Jacksonville lead to 14-10 with 8:25 left in the first half. The Dolphins answered back with two more rushing touchdowns to take a 28-10 lead late in the third quarter. An eight-yard touchdown run by Jonah Hodges followed by a two conversation catch by D'Angelo Barksdale cut JU's lead to 28-18 with 14:39 left to play, but the Dolphins struck back immediately with a 23-yard touchdown pass from Bell to Guy Dorian to clinch the first win in their newly renovated stadium. 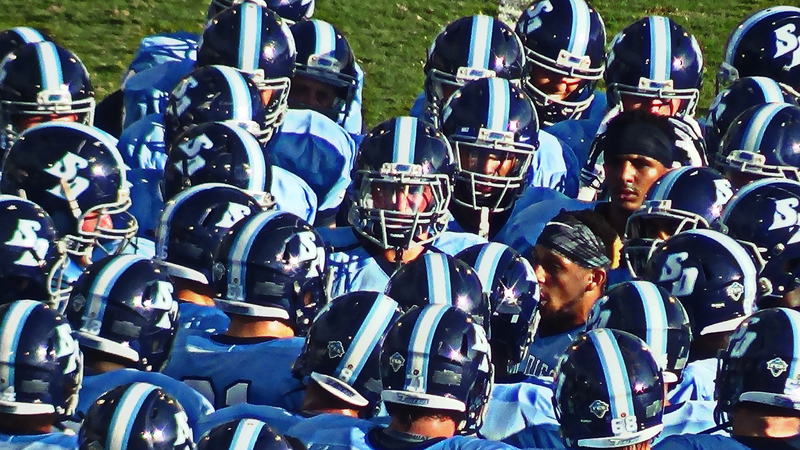 The Toreros return home next Saturday, September 20th to host the Ivy League's Princeton Tigers.